It was cold. Our breath steamed, curling up into the velvet black sky where stars twinkled. On the horizon a pale hint of dawn. Gradually the sky turned a pale orangey pink as the morning broke, revealing a cold glittering world. Leaves, grass, bracken and trees were all etched with crisp white frost. 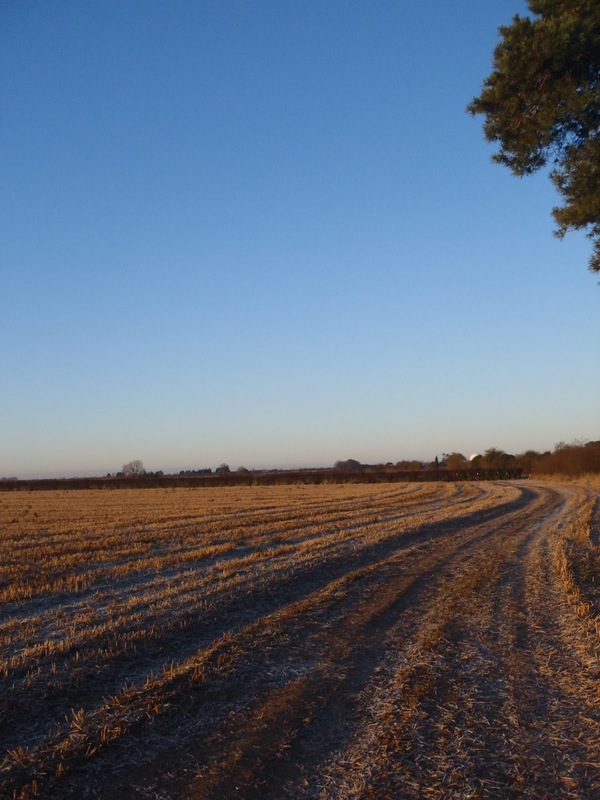 Small opaque patches of frozen puddles nestled in the tracks and furrows of the ploughed fields. In the corner of a field of stubble, cropped short and spikey, the hedgerow was alive with birds. Large groups of finches, buntings and sparrows race along the hedgerow, chattering from the tops of the taller trees, before dropping down into the stubble in search of seeds. Seemingly as one, the flock flushes back up into the cover of the hedge, keeping up the constant twittering before moving a little further down the field as the group of well wrapped up ringers set a series of strategically placed nets. The lure of a rich source of food on such a cold morning however was too much, and it was not long before the flocks had returned, with more than a few falling into the nets. By mid morning the sun was fully on the nets, which billowed ever so slightly in the breeze that had picked up. The birds were also becoming net wise, now feeding just a little further up the field, tantalising the ringers who watched the empty nets. Up until then however, it had been pretty hooching as a certain Mr Barber would say. It was not so much quantity, although 67 birds in a little over two and half hours is nothing to be sniffed at. It was the quality. Yellowhammer, chaffinch, lesser redpoll, brambling and not forgetting the star of the show for me, the tree sparrow. With its chocolate brown cap, black spot on a brilliant white cheek and stubby beak, I never tire of the beauty of this little farmland bird. 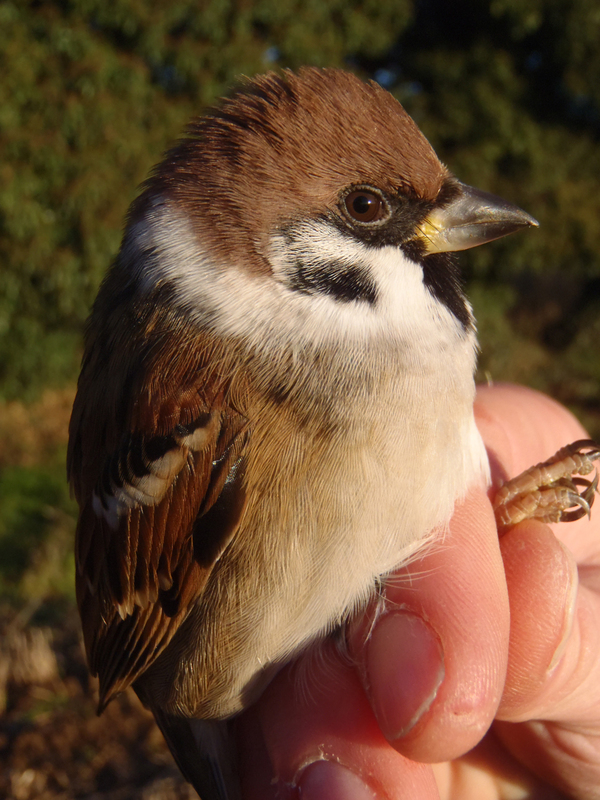 Once again ringing at this site has provided valuable information on tree sparrow movements. 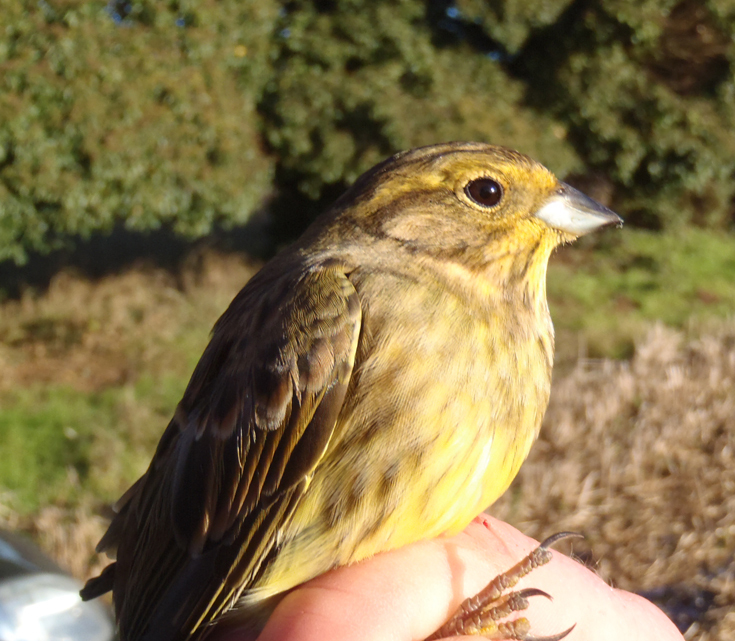 Last year we caught a bird from Spurn Point in Lincolnshire, this year something a little more closer to home, a young bird originally ringed this summer near Bury St Edmunds, Suffolk. With more ringing planned at the site over the coming winter months, we may well catch more ringed tree sparrows that should provide further pieces to the ongoing puzzle.